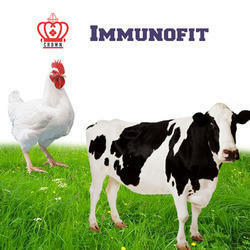 Crown Immunofit is an effective immuno-modulator (activator), adaptogenic and anti-stress formula to improve the IMMUNE SYSTEM and helps to overcome various problems due to STRESS conditions in birds and animals. Its anti-stress and adaptogenic herbal medicines help to overcome the disastrous effects of stress due to various conditions. INDICATIONS: As a supportive therapy in all IMMUNO-DEPRESSING conditions, especially due to. Stress due to all external factors like extreme heat or cold, changes in humidity, other changes in weather and farm-environment. Stress due to all internal factors-during conditions of various diseases, and convaiescence from various diseases. POWDER: Fine (mesh: 150-200) and dry powder. LIQUID CONCENTRATE: Has similar beneficial effects as that Crown Immunofit-Powder. Presentation : 1 Litre & 5 Litre Plastic jars. Looking for Herbal Feed Additive For Immunity ?